I POP the clutch and slam the gas. The rear of the Dodge Challenger Hellcat skews sideways, Pirelli tyres battling for grip and losing the good fight. Thick curlicue coils of tyre smoke erupt under the rear wheels. And yet the Dodge muscle car is only crabbing forward, rear tyres spinning so furiously that they seem to be scrubbing the road clean. I let off the gas, ever so slightly, and the tyres get just enough traction to catch, and we’re off. Now I’m moving, fast, the full 650 pound-feet of torque catapulting us down the road. I’m fully into the gas now, and the car seems to be reverberating all around us, a thudding frequency most often heard from heavy farm machinery and M1 Abrams tanks. I hit a bump in the road, unsettling the chassis. I hit 60 miles (97km) per hour in first gear, then kick in the clutch and pull down the shifter into second. The road is sliding underneath us at an alarming pace, fence posts on either side clicking by like reels in an eight-millimeter film. Then, the first yellow sign that reads, “Pavement ends.” I haul on the brakes. 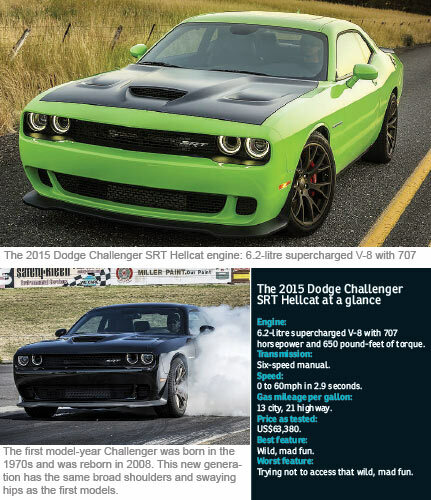 There is no conceivable need for Fiat Chrysler Automobiles NV (FCAU)’s brand-new 2015 Dodge Challenger SRT Hellcat. In some other form, I suppose, its 6.2-litew, supercharged Hemi V-8 could be used to power a Navy destroyer, or open and shut the gates of the Hoover Dam, or just shove the San Andreas Fault back in the right direction. But, no, instead Chrysler’s Dodge division decided it needed to outfit the special Challenger model with an oxygen-gurgling heart that produces 707 horsepower. That’s more powerful than most exotic supercars. And then they gave it a starting price of about US$60,000 (RM201,600). That is the rough equivalent of buying a bespoke suit for US$300 or an apartment on Manhattan’s Fifth Avenue for US$500,000. You don’t get that big a bang for such little bucks. It’s spit in the eye of all convention. For whatever reason, muscle cars are very much still part of the conversation when it comes to American vehicles, efficiency and practicality be damned. And the Challenger, a big beefy slab of throwback Detroit metal, has long been eclipsed by Ford Motor Co’s Mustang and General Motors Co’s Chevy Camaro. Its masters decided it was time to be heard. Enter the Hellcat. It should be noted that the 2015 Challenger can be had in all kinds of variants, including the base V-6 that starts well short of US$30,000 and gets a very sane 30mpg highway. That car is more stylish than the Hellcat, with brightwork and details like the double grille that show attention to detail. It’s a very cool car indeed. The first model-year Challenger was born in the 1970s and was reborn in 2008. This new generation has the same broad shoulders and swaying hips as the first models. But with only two doors and sheet metal that stretches on for days, it neither looks nor plays the part of a modern sports car, let alone a crowd-pleasing crossover or sensible sedan. Hellcat buyers will ante up the US$61,000-something to put a Joker-worthy smile on their faces. The Hellcat comes as a standard six-speed manual transmission or very slick eight-speed automatic. It’s equally easy to burn out in either. And it goes like this. In sport mode, with traction control still fully on, slam on the gas. Hang on to the wheel and keep it pointed straight. Control the front wheels, which have suddenly gone light because the hood is lifting heavenward. Look in the rearview mirror; observe smoke. Let off the gas slightly. Proceed onward in orderly fashion, pretending that high-definition strips of rubber left on road are in no way related to your Challenger muscle car.